Latinos continue to contribute significantly to the America’s landscape and economy. According the U.S. Census Bureau, the Hispanic population nationwide is 59 million. Hispanic buying power in the United States will reach $1.5 trillion dollars in 2017, according to Selig Center for Economic Growth. We were curious to see which counties in the U.S. were experiencing the greatest changes in their Hispanic population. Data from the American Community Survey was used to help us answer this question. 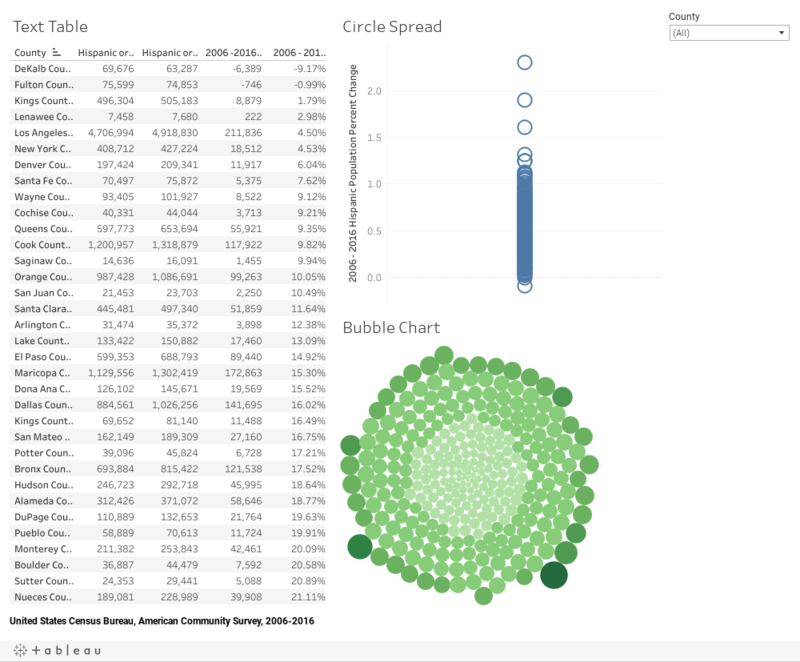 In addition, Tableau was used to visualize and analyze the data. According to the dashboard, we see that Luzerne County in Pennsylvania had the greatest percent increase in their Hispanic population from 2006 to 2016 at 222.90%. In terms of the absolute population, Harris County in Texas had the greatest growth as their Hispanic Population increased by 461,310 between these same years. In contrast, DeKalb County in Georgia has experienced the greatest decrease in their Hispanic population on an absolute and percentage basis. DeKalb County’s Hispanic population has decreased by 6,389 between 2006 and 2016, which resulted in a 9.17% decrease of its Hispanic population. What do you think is driving the Hispanic population increase in Luzerne County (PA) and Harris County (TX)? Conversely, what do you think is driving the Hispanic population decrease in DeKalb County (GA)?